We're a global award-winning ticketing and event registration provider and we're looking to kill off the ticket tout and solve fraud for the 1 in 8 customers who get caught out buying from Facebook, event websites and national/international branded secondary sale websites. 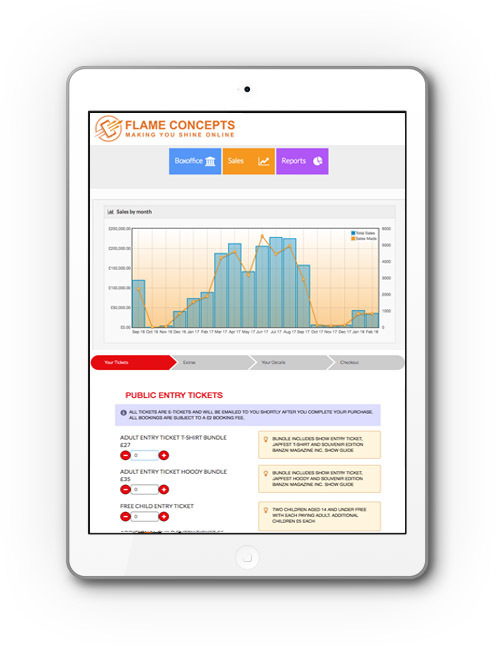 There is a crisis in the ticketing world and we want to bring back the trust and integrity to the industry and give customer and businesses the power of control. We are creating fraud-proof ticketing with a new fan friendly trusted and secure marketplace for consumers to safely search, buy and sell tickets. This will help empower customers and support venues and events create great experiences from start to finish removing fraud for consumers being ripped off and bring back integrity to the market and establish a new industry standard. There is a globally growing market in the events world, worth over $71B in 2019 and growing at just under 10% YOY. In the UK there are 10,000 venues and 7,000 outdoor events. With government and consumer pressure on secondary and primary sale issues growing, the industry has a need to act to help resolve these issues. Little is being done by the major players who are introducing 'fan exchange' sites at extortionate costs so the gap is not being closed and opportunities exist. We've been trading since 2012 and in ticketing, since 2014 and with previous experience in a ticketing start-up on top of years of experience in business growth, we have a solid team of advisors and experts. Leading that team is an ex-Vice President of Hewlett Packard who is now a business turnaround and growth expert. In support we also have a strategy and team development expert, a software expert and finance with sales and marketing being recruited - we have the skills and experience and continue to grow in force. If you feel you want and can bring something to the table to support the business, do get in touch and we'll be happy to discuss. We're relaunching justbookitnow.com in 2019 to become the market place for booking events, days out and accommodation. We're expecting upwards of 30,000 events live on the website to promote when we push the site live that will include national, local and independent events providing the biggest source of events around. Whether or not a venue has or needs ticketing, we'll promote them. 'Ticketing with Integrity' has been at the heart of what we do and we will extend this site and its features to bring the best user and fan-based experience to life as part of the project. We're EIS registered and expected returns are forcast to be to industry standards of at least 10x. With a global appeal and team in place, the investment opportunity is live and we'd welcome the chance to discuss your involvemnt with us. If you would like to invest or to find out more about how to get involved, get in touch and we'll send you an advance copy of the Executive Summary or call 01900 268281 and ask for Steve to discuss ideas.